OK, time for another photo-heavy post! I hope you enjoy this photo-tour of another local school garden. 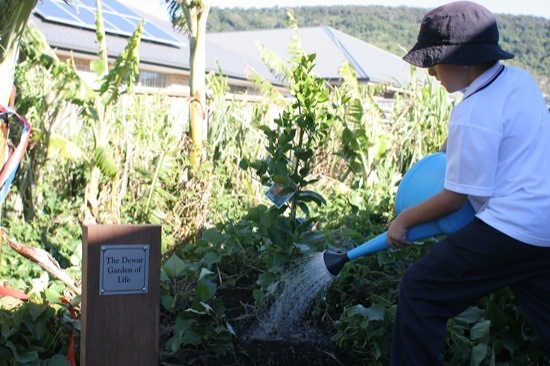 A couple of weeks ago, Mrs Xuerub from Jamberoo Primary and I went along to the official opening of Mount Terry Public School’s new permaculture garden. 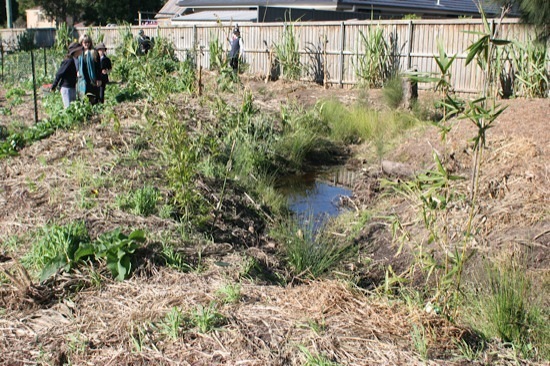 This garden was the brainchild of teacher Stuart Hall, who was given a grant by Shellharbour Council to gain a Permaculture Design Certificate. 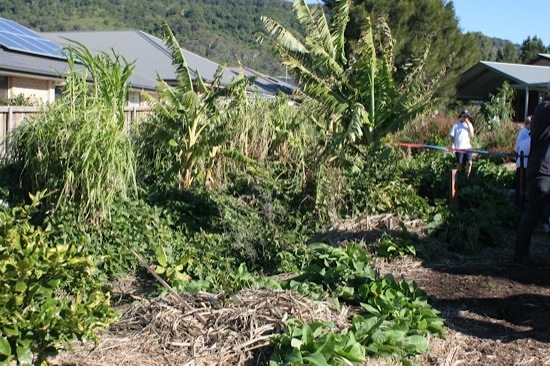 Stuart has certainly put his new skills to work in this garden, along with local permaculture designer Aaron Sorenson (designer of the fantastic Kiama Public School permaculture garden). 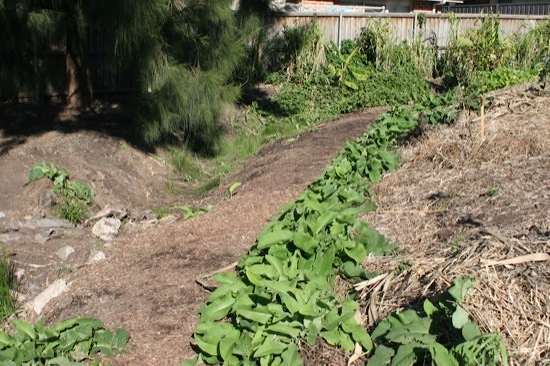 The primary feature of this garden is a water channel running the whole length of it. I think it used to be a stormwater drain along the edge of the school property that had to remain. In true permaculture style, the problem is the solution. The drain was turned into a meandering creekbed, flowing through the garden and providing passive water storage, a bit like a swale. Safety is always a big concern when building school gardens, especially in primary schools where younger children are present. Ponds must be no deeper than 30 cm (about a foot) to prevent danger, but there was also a desire to capture rainwater and allow it to hydrate the surrounding gardens. The solution was to build little dams or gabions across the creekbed at regular intervals along its length. These were sized so the water pool behind each one would be no more than 30 cm deep, but would hold enough water to help the surrounding plants – just like a swale. The dams also provide lots of handy spots for students to cross the creekbed without getting their shoes wet. At the end of the creekbed, the water collects in a shallow dam or billabong. This makes for a nice little wetland area. 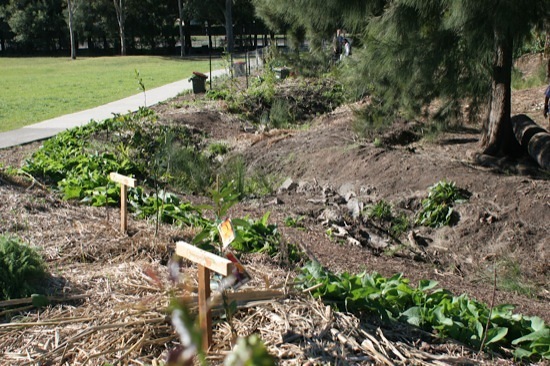 Along the banks of the creekbed, sweet potato and nasturtium have been planted as ground covers. This living mulch outcompetes weeds and grasses while providing an edible harvest and biomass for composting. 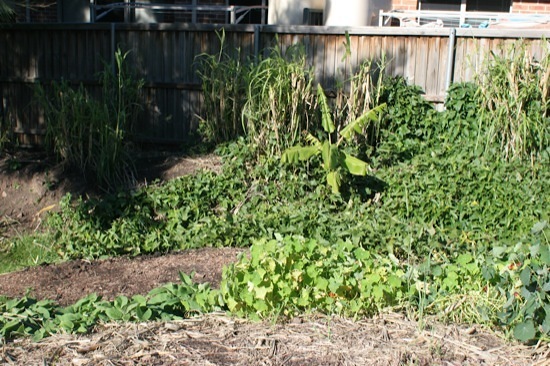 Bananas and bana grass have been planted along the edge of the school property to screen the fence and to give some privacy to neighbours. Both plants love the moisture provided by the creekbed. They also provide a windbreak to help protect young fruit trees, and pump out lots of biomass for mulching and composting. Paths in the garden have been edged by comfrey. It provides a good barrier to keep out invading grass runners, and is tough enough to stand up to the regular trampling of people use the paths. When it gets a flush of new growth, the students just cut it and drop it right there on the garden as mulch – no need to collect and carry, just chop and drop. I’d love to know how they got so much comfrey – I really need to propagate a lot this spring! 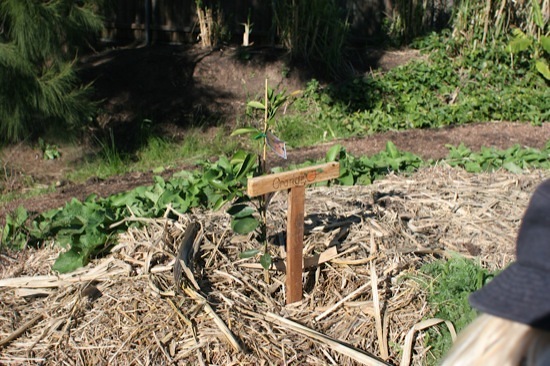 Towards the end of the creekbed, where the garden widens out, the students have built a plot for their annual vegetables. It’s fenced to keep out chickens and other animals. 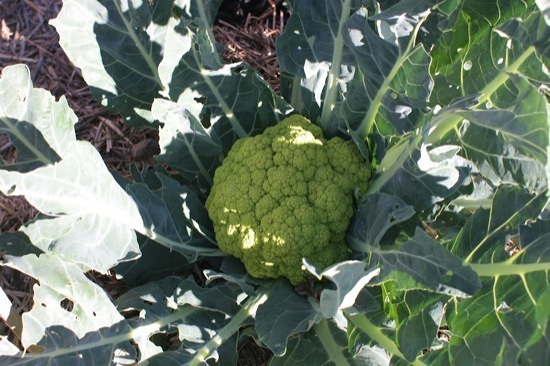 Even at this time of the year, they had a lot going on with cauliflowers, broccoli, tomatoes, spinach, herbs, peas, and many other varieties. One top tip given to me by the students was to always put a banana peel in the hole before planting a tomato seedling. They reckon this nutrient boost is the secret to their highly productive tomatoes! Dotted around the gardens are these wheelie bins (donated by Shellharbour Council). I assume they were damaged bins – the bottom has been cut off them, and they’re partially buried in the ground. 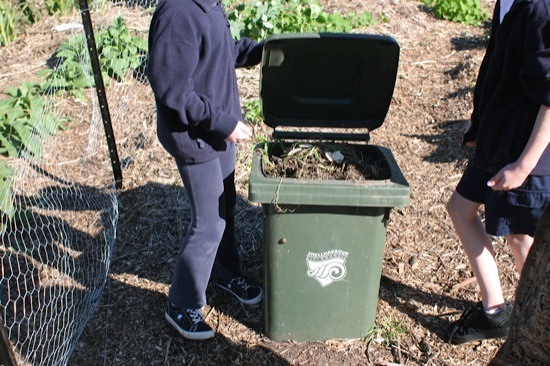 They make a fantastic compost bin, with an attached lid that won’t blow away. Mt Terry also has some poultry. 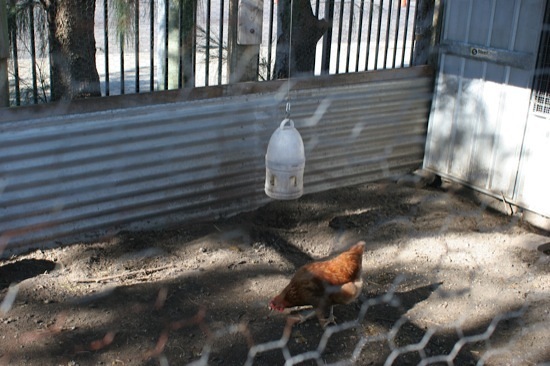 I really liked this super-secure chicken tractor, made out of lengths of weldmesh fencing. It has weldmesh on the base as well, so nothing can dig under the edges. This thing would last for decades! 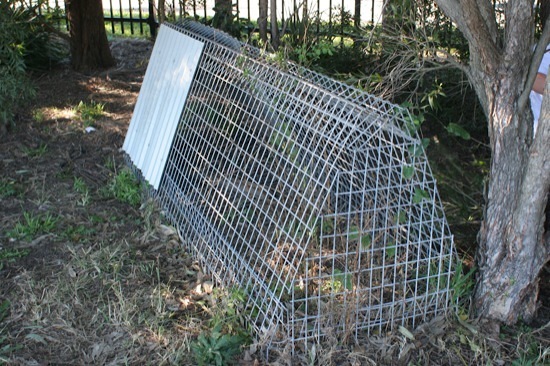 The main chicken pen is a fairly standard coop-and-run setup, with corrugated iron around the edges for predator protection. 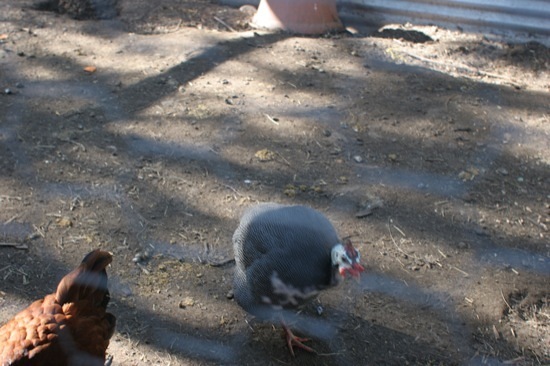 As well as the chickens, they had guinea fowl in the run. The kids told me they help protect from predators by making a lot of noise whenever threatened. In a school setting, a nice big seating circle is an excellent idea. It gives a gathering place to start and end each lesson, with plenty of room to move around, and lets all the kids see what’s going on without being stuck at the back of a group. 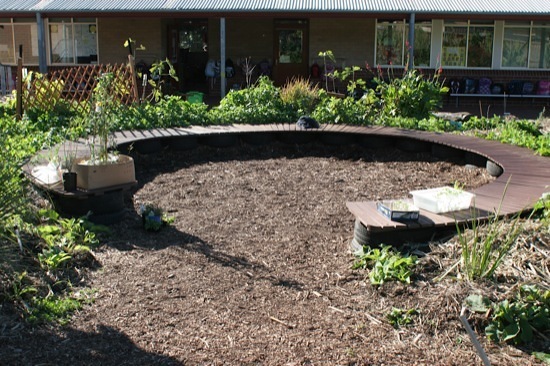 This style of circle is a signature feature of Aaron’s school garden designs, very similar to the one at Kiama Public School. This is a fantastic idea for allocating various tasks out to the students. 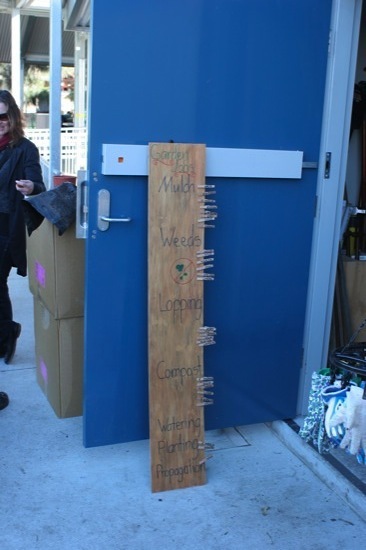 Each student has a wooden clothes peg with their name on it, and the board has a list of jobs that need to be done. During the planning stage of the lesson, the pegs are placed next to the jobs so everyone knows what they’re supposed to be doing. One of the problems Stuart encountered early on was what to do with all the kids’ gloves at the end of each lesson. If they just shoved them into a box in the store room, the damp gloves got mouldy and smelly. He found these hangers at an op shop, and attached them to a frame salvaged from a clothes store’s junk pile. 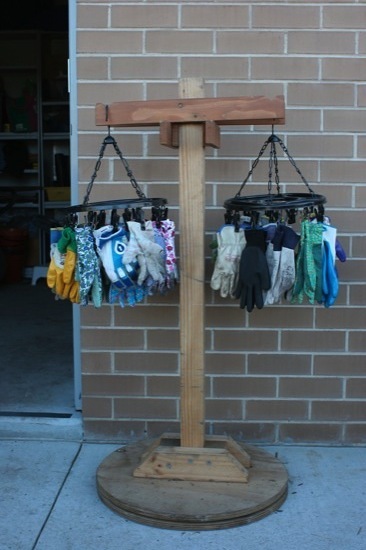 Not only does it let the gloves dry properly, but it keeps the pairs together so the kids can get started on their jobs quickly. So what happens with all the produce the students grow? 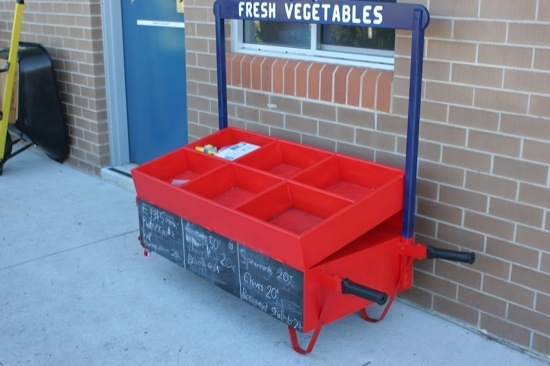 They load up their vegie cart, and sell it in the school playground! The cart was built by the local Men’s Shed (a fantastic organisation that I just can’t say enough good things about!). 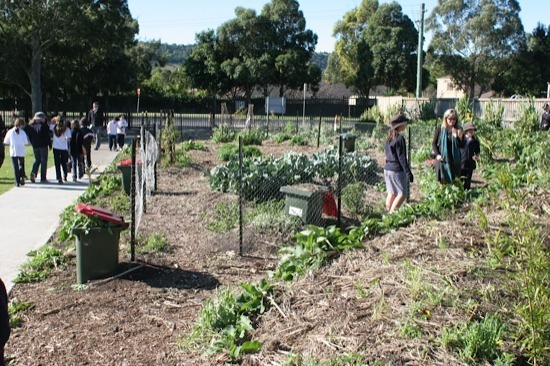 Does your local school have a vegie garden? 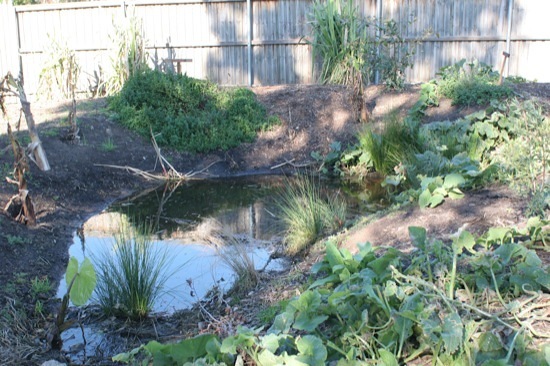 Or even better, a permaculture garden? How is the garden integrated into the school’s curriculum? I’d love to see photos if you have them! I’m after as many ideas as I can get for Jamberoo Primary’s gardens.